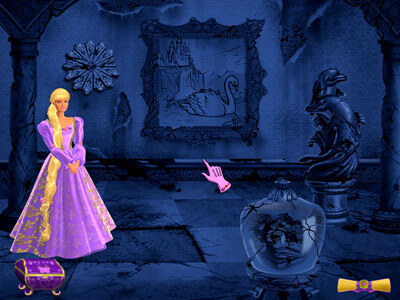 Let’s keep this Barbie kick going with another game based on the alpha doll appropriating another classic fairy tale (a somewhat profound proposition to be sure, since Barbie is, herself, the modern embodiment of a fairy tale). Fortunately, Barbie as Rapunzel is already in the database, so this is just a screenshot recon effort (and credits entry, and I see that the description could use a touch-up). 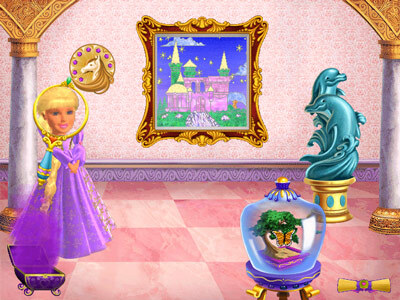 In the story of Rapunzel — or at least in Barbie’s version of it — Rapunzel and her Prince Stefan are going to throw a masquerade ball. An evil witch named Gothel grows indignant that she did not get an invite. 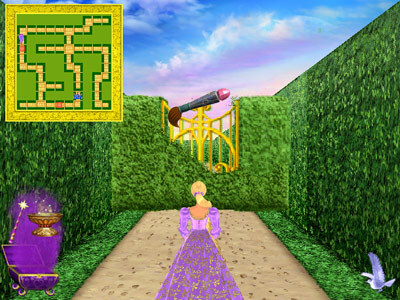 So she casts a spell on the castle, throwing it into immediate disrepair and the prince is turned to stone while 6 stones from his crown are scattered about the castle grounds. Gothel seems to have exacted the perfect revenge in response to the snubbing. 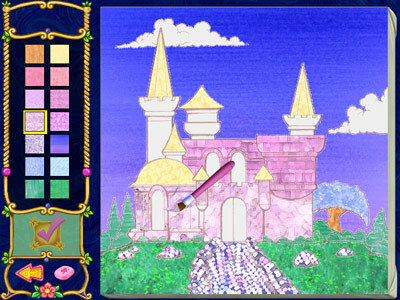 You get to select a painting design, color it as you see fit, and select a frame. Printing afterwards is optional. This is an interesting activity, algorithmically, because, rather than a freeform brush or area fill method, the paint brush only works on a particular layer as the program makes you work across sections of the painting. After the room has been completely revitalized, you get to use a magical magnifying glass to find one of the stones in the room. And, long story short, the prince is rescued and the masquerade ball proceeds as planned. And the final insult is that Gothel’s evil spell was completely undone in less than a half hour.